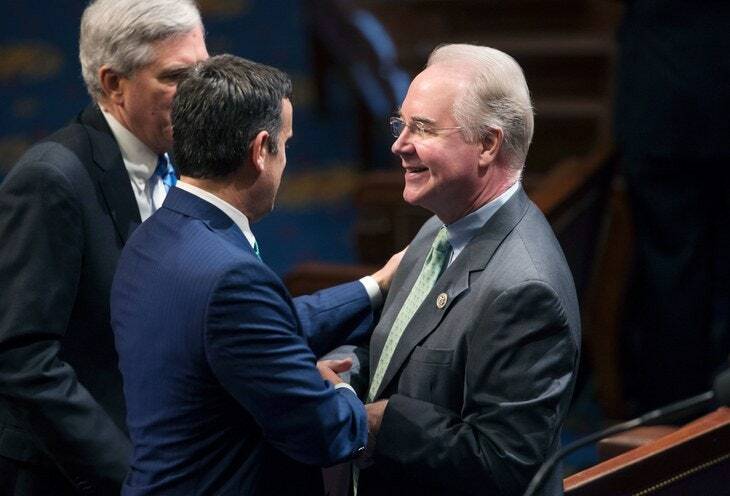 Price would have broad oversight over FDA policies regulating drugs, medical devices, and diagnostic tests. That made lawmakers particularly interested in allegations, reported by CNN, The New York Times, and the Wall Street Journal, that Price traded more than $300,000 worth of stocks in companies that stood to benefit from legislation he supported or drafted. Three Democratic senators tried unsuccessfully to postpone Price’s hearing pending an inquiry into whether he violated House ethics rules; when that effort failed, they questioned the candidate directly. Asked today where he stands on the government’s role in providing access to affordable healthcare, Price said it is imperative that all Americans “have the opportunity to gain access” to insurance coverage. He did not say exactly how that might happen. Pressed on Trump’s promise to provide “insurance for everybody,” Price said, “I am committed to making sure every single American has the coverage they want.” Again, he offered no specifics. Trump’s views on abortion and reproductive rights are fluid, but his vice president, Mike Pence, and others in his administration staunchly oppose abortion. Price has a long record opposing a woman’s right to choose and enjoys a “100 percent” rating from the National Right to Life. In 2005, he co-sponsored a bill that would have defined human life as beginning at conception, which would have banned most abortions. Sen. Cassidy To Rep. Price: "You Are The Exact Kind Of Person To Have This Job"
Rep Price On Choosing Public Service: "I Have A Passion For Public Service And A Passion For People"